Combine tamari and honey in a small bowl, and set aside. Heat oil in large skillet over medium-to-high heat. Season chicken with sea salt and pepper. Cook chicken, stirring occasionally, until chicken begins to brown, about 3 minutes. Lower heat to medium and stir in garlic and ginger. Add scallions and cook for 1 minute. Stir in water chestnuts and tamari mixture. Continue to cook until chicken is cooked through, about 4 minutes Remove from heat and sprinkle with cashews. 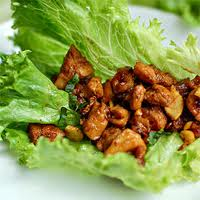 Divide lettuce leaves among individual plates and spoon chicken over the top. Serve.